On previous visits, I have wandered around and photographed the outside of the historic Old Faithful Inn, but never bothered to step inside. I had no idea what I was missing until seeing footage of the inside on a Travel Channel show on Yellowstone. Wow! 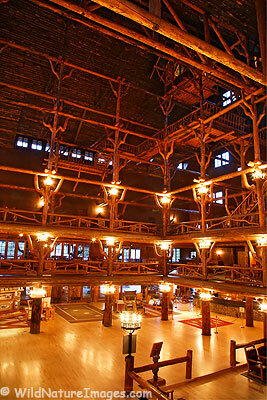 I have seen other hotels with huge, impressive lobbies like the Old Faithful Inn, but none of them were built entirely of logs over a 100 years ago! It really is a beautiful structure. The days are getting long – I got into camp the night before about 10:00 p.m. from Grand Prismatic Spring, and we had to get up at 4:15 a.m. to get this photo. Why so early for an interior? Two reasons. First, because it is so dark inside, I found the light streaming in from the windows was overpowering my day photos of the interior. I needed to have it almost dark outside to get a nice balance. The other reason, it would be the only time the lobby was empty – evenings the place is very busy. Here is more posts about Yellowstone on this photo blog. In addition, check out our collection of Yellowstone National Park Photos. Yeah, I stepped outside right after this for some nice morning light. Sure you can quote me. Thanks. I wouldn’t mind creating a post or elaborating on a lot of the subjects you write related to here. Again, awesome website!